Robbie Williams made an incredibly smart and brave decision to quit social media, right before World Mental Health Day (October 10, 2018). Robbie William’s made an incredibly smart and brave decision to quit social media, right before World Mental Health Day (October 10, 2018). The X Factor trolls on Twitter can take all the credit. It’s always hard to imagine our idols suffering like the rest of us ‘normal’ people do. But we are starting to see a trend, where due to the increasing pressures of fame, they often suffer more than normal people. Here are some celebrities who have battled with their demons that I’ve written about recently: Kate Spade, Anthony Bourdain, Jeffrey Star, Mac Miller, Michael Phelps. It makes you wonder, how is it possible that people who uplift millions with a song or performance can ever feel down? I myself was always the star of every performance growing up, and the life of every party. I was really into skiing, dancing and rollerblading, and many other adrenaline generating activities. But after tragedy struck in my family twice in the same year (two of my sisters died), I had to be medicated for a few years. I was not a great big star with millions of followers at the time, but I will try to express some of the things I felt. Let’s just times that by about 100 million to understand how someone like Robbie Williams must feel when it hits him. The Shame — the moment you realize that no one will ever look at you the same again because there is obviously something wrong with you. Forget about other people — you think you won’t ever look at yourself the same way in the mirror the same again. But one day, all that will be behind you. Shattering of the Ego — gone is the illusion that you are a perfectly amazing specimen of a human. You may have been told you are beautiful and amazing, but clearly there is something wrong with you if you had to go to the doctor to be fixed. We’re not talking about a broken bone that can be fixed easily. We’re talking about something far deeper inside that is no longer in balance. Things Will Never Be Good Again — the dark parts of us are very persuasive at allowing us to believe that nothing will ever be good again. That life isn’t really worth living, that there is no point in going on like this. Tomorrow won’t be a better day than today. But somehow, if you manage to overcome those feelings, you will eventually experience greater joy, because you will appreciate it so much more than before. I’m willing to bet that there were days when Robbie Williams never dreamed he would have such a beautiful and supportive family around him like he does now. Somehow he hung in there, got through the rough days and emerged a winner over and over again. I’m sure that whenever things look like they are heading in a certain direction, he taps into that place where he got the super-human strength to do that. Let me explain to you why Robbie Williams made such a smart decision to quit social media. We are not always aware of this but it’s our environment that determines everything about us — what’s important to us, our mood, our goals, and habits. There are certain environments we have no control over, such as what family we are born into, or what kind of lifestyle we become used to growing up. But as we get older we do have the ability to make better choices about our environment. So being aware that negativity can set off his mental health issues, Robbie William’s decision to get out of the toxic environment on Twitter was a very smart move. Unfortunately we live in a society today where it’s really cool to trash other people. It’s become a new form of entertainment in our time. Putting other people down somehow makes us feel better about ourselves. And the internet is a tool that gives individuals who may have nothing the power to hurt others. It’s a heady feeling if you have nothing else to get excited about in your life. Human desires have evolved and the problem is that we are not really aware of this. So the gap between the things we think will make us feel fulfilled, and new ways to feel fulfilled that we are not really aware of yet, is what is causing this tremendous wave of mental health issues. We are seeing it in all parts of society but especially in young people who have grown up on these screens, which clearly are not so great for having a healthy and balanced state of mind. More than anyone else, young people need to be outdoors running around, making new friends, trying new things. Their life is so different to the world Robbie Williams and I grew up in. There is this tidal wave of negativity in the world and it is a direct result of the negative thoughts we have about one another. Think about it. We have been conditioned from birth to always try to outdo those around us. There was an understanding that in order to be happy and succeed in life, we must be better than those around us. So instead of combining all our unique attributes to advance together as a whole, we put each other down at every opportunity. Even if we don’t do this out loud on social media, we are doing this in our hearts and minds. And our negative thoughts about other humans impact the world around us in a profound way that we are not really aware of yet. Our lack of concern for other human beings, is another factor that is causing our world to be out of balance. There are positive things going around the internet and also a lot of negative things. We have no idea how easy it is to get infected with these negative viruses going around. The more we expose ourselves to negative content, the more we are opening ourselves up to feeling down. That’s why people are starting to switch off social media (like Robbie Williams just did), or stop watching the news and buying newspapers. They understand that all that negative content is bringing them down, and they are absolutely right. If we want to feel good we need to surround ourselves with uplifting content and positive people. Most humans are about to be replaced sometime over the next decade or two by a robot. So that’s caused some to contemplate what we are doing here. If our purpose is not to get up and go to work every day, then what’s the point? Since our society as a whole still lacks the answer to this eternal question that more people are starting to ask themselves, more individuals are falling into deep states of depression. The emptier we feel from a lack of answers, the more people are turning to substances to try to fill that dark hole inside. The future looks bleak. What we are really going through is a period of uncertainty and that always comes before great changes. If we became more aware of our purpose for being here, and the process we need to go through together, we could go through this transformation in a far more pleasant manner. So what is the meaning of life? What is the point? For us to reconnect like the harmonious unit we were in the past. But this time, we have to do it above all these huge gaps we’ve created between ourselves. There was a time, thousands of years ago in Babylon, when everyone spoke one language. But when the human ego grew, conflicts erupted and people could no longer understand each other. These divisions in society led to new languages being formed. Look at the great walls we’ve put up between us throughout the generations, and you’ll understand how we have our work cut out for us. While all this was going on, one person decided to get to the bottom of it. That person was Abraham our forefather, who discovered a method for rising above the human ego and connecting at a higher level. He gathered people to his tent to teach them the method, and that group later became the people of Israel. So my beautiful country, Israel, has a method of connection that it must share with the entire world. There is so much emphasis in today’s world to be a successful programmer or entrepreneur, creating an amazing app that millions of people will use, and make a great exit. And since all the focus is on this new technological area of our lives, it is really at the expense of other areas. Schools are a place that could prepare us for the great social changes ahead, but all the focus is on excelling at STEM subjects (science, math, engineering and technology). To reach our full potential as humans we need to have deep connections with other humans in our lives. We need to surround ourselves with people who really love us, and who will support us through anything. We need to learn how to progress together as a team, rather than let one human ego rise above the others. It’s already a known fact that the collective wisdom of a group of average people will be better than an expert’s opinion. In order to be truly happy we need to fully develop the human aspects of our life. That includes finding a life partner and creating a family — something that has really gone out of style in many ways. And those that are tying the knot are choosing partners for all the wrong reasons, so their relationships cannot stand the test of time. The family unit has always been the foundation for human life. Nature designed things this way so we would go through life sensing how dependent we are on the others in our little family unit. This is a great example of how entire societies must get along today, like one big happy family where everyone pitches in. But in our world we’ve lost that feeling of dependence on others because we have everything we need at our fingertips. 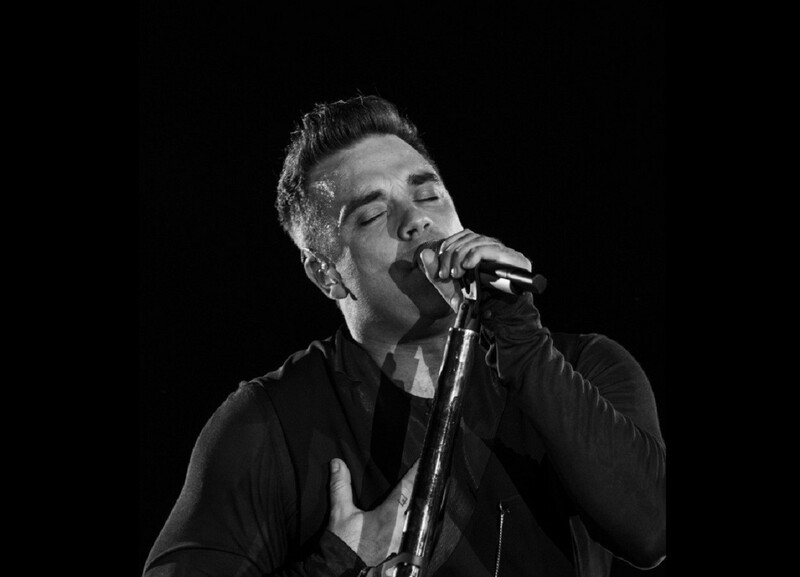 Robbie Williams has chosen love over hate. And by doing so he has set a really good example for many people. We all have this choice at any moment in life but we don’t always make the right choice. So the universe reminds us a few more times until we get it right. He chose life when he decided to start a family with his incredible wife Ayda, who has been with him through thick and thin. He knows he can depend on her to be there no matter what. He chooses life every time he overcomes all his anxieties and gets back on that stage to entertain us. He chooses to get up every day and face the world, which is an incredible achievement for anyone suffering like he does. Dedicated to sharing all the good from Israel with the world.